Preheat oven to 375 degrees. Grease a cookie sheet. Cream shortening and sugar until light. Add eggs. Add hot water and vanilla. Then add flour, salt and baking soda to mixture. Add oatmeal - if using a mixer, stir in by hand the chocolate chips and nuts. Drop by spoonfuls on a greased cookie sheet. 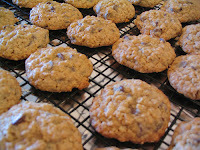 Is the Chocolate Chip Rolled Oats Cookies, a Guatemalan recipe? Good brief and this mail helped me alot in my college assignement. Thanks you seeking your information. Brim over I to but I contemplate the brief should prepare more info then it has.